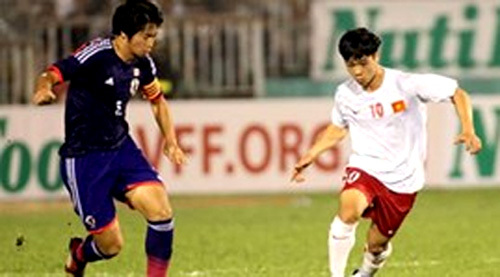 VietNamNet Bridge – Vietnam’s U19 football squad will fly from Ho Chi Minh City to Japan on June 8 to begin a training camp and compete in six friendly matches. They will face Japan’s national students team, U18 Cerezo Osaka, student teams from Hannan University, Kansai University and Osaka Sangyo University, and U18 Gamba Osaka. As planned, the team coached by Guillaume Graechen will stay in Japan until August 30. They will then return to Vietnam to prepare for the U19 Southeast Asia Championships 2014, to be held in Hanoi from September 5-13. The tournament, organised by the ASEAN Football Federation (AFF), aims to support the U19 AFC Championship finalists in improving their professional skills. According to draw results, U19 Vietnam will take on archrivals U19 Japan and U19 Australia in group B matches. Group A includes U19 Myanmar, U19 Thailand and U19 Indonesia.